Palestinian amora of the fifth generation (4th cent. ); son of R. Abin I. (Bacher, "Ag. Pal. Amor." iii. 724) and the teacher of R. Abin II. (Yer. Ned. 3b). He was at first the pupil of R. Jose of Yodḳart, but the latter's indifference to his own family caused Jose to leave him and follow R. Assi or Jose II. (Ta'an. 23b; Weiss, "Dor," iii. 117). Jose was the most important among the last halakists of the Palestinian amoraim. He had a thorough knowledge not only of the Palestinian customs and halakot, but of the Babylonian, a fact that has led some scholars to maintain that Jose must have resided at some time in Babylonia. It is probable, however, that he derived his knowledge of Babylonian teaching from his father, who had traveled in Babylonia. 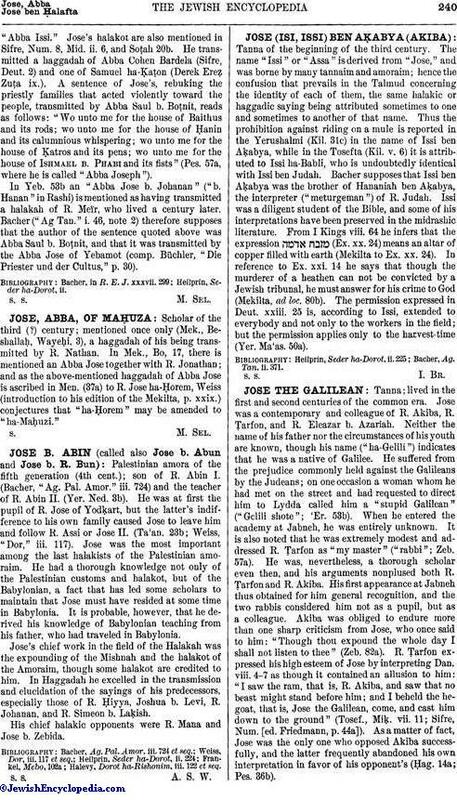 Jose's chief work in the field of the Halakah was the expounding of the Mishnah and the halakot of the Amoraim, though some halakot are credited to him. In Haggadah he excelled in the transmission and elucidation of the sayings of his predecessors, especially those of R. Ḥiyya, Joshua b. Levi, R. Johanan, and R. Simeon b. Laḳish. His chief halakic opponents were R. Mana and Jose b. Zebida. Halevy, Dorot ha-Rishonim, iii. 122, et seq.